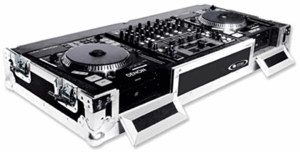 Our Denon gear Flight Zone case is designed to transport and protect one Denon DN-X1500 mixer and two DN-S5000 CD players. Cleverly laid out with very little gaps in between the players and the mixer by utilizing 1/2" high-density foam between the CD units and the mixer. This allows for quicker movement when it comes to manipulating the CD players and the mixer, and reduces the width of the entire console by 3". Detachable lid included (not shown). Includes recessed wheels. Width Height Depth 34" 18.5" 9"